Samoa’s Government is in talks with its counterparts in Tahiti and American Samoa to increase Samoa’s internet capabilities. Samoa is currently connected to the internet via satellite and the older American Samoa – Hawaii Cable System. 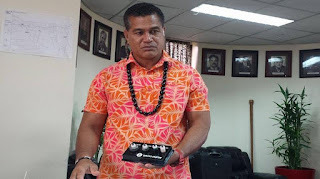 According to Samoa’s Minister for Communication Information Technology, Afamasaga Rico Tupa’i this needs to improve to meet the growing demand for connectivity. “Our active Samoa Submarine Cable company are also in talks with Tahiti for an additional connection from there as well,” he said. The minister also indicated that Samoa will not only rely on the submarine cable project linked to the Southern Cross Cable in Fiji. “It’s important to know that we aren’t going to wait around for the connection from Fiji to complete, which is by September this year. Complacency is the enemy here, when we know that this one submarine line isn’t enough to hold the standard we aim for,” Afamasaga said. Samoa Submarine Cable Company Limited and Alcatel-Lucent Submarine Networks signed a contract to roll out a new submarine cable system named Tui-Samoa Cable. The undersea cable will span more than 1,470 km, providing an advanced broadband highway. Tui-Samoa Cable will have landing points in Apia, Tuasivi on Savaii Island and Suva, Fiji. As for the project with American Samoa and Tahiti, the government of Samoa hopes it will be achieved by late 2018. “We would have the capacity to reach the rural areas not just at home, but in schools, at hospitals and businesses. All that can be accomplished with good communications,” Afamasaga added. “This is why we have also started work on our broadband highway centre here in Samoa. So that once the Tui- Samoa cable reaches here by September we would have already had somewhere it could connect to,” he added. The Minister for MCIT says costs of internet would reduce by half. Afamasaga says such a drop would benefit Samoa in more ways than one. “This is the beginning and once it’s off the ground we will then start to look at things like planes, businesses and even that call centre we have been dreaming of setting up,” he said. “The better the communication and connection is the more eyes will be on Samoa for businesses and imagine the wealth in our country when we have all these good established businesses stationed in Samoa,” he added. According to Afamasaga, once the (Tui-Samoa) cable is up and running in September, it will take another two or three months to begin digitizing Samoan technology, starting with television.